First-time home buyer | Maryland Virginia D.C.
We have local experienced Loan Officers who specialize in first time home buyers. We will help you find the lowest interest rate with the lowest out-of-pocket expenses. Today’s new home market is providing the lowest prices and highest amount of seller paid closing costs that we have seen in years. Contact us today so I can help you into your first home. --What is “seller help /seller paid closing cost”? How can it help me? --How do I know how much that I can get approved for? --What additional cost can I expect when purchasing a home? Available mortgages * Note: The vast majority of lenders require a minimum credit score of 620. Exceptions can be made for those with lower credit scores; you will need a thorough analysis of your credit, income and assets upfront. How does the $8,000 tax credit apply to me? The Worker, Homeownership, and Business Assistance Act of 2009 extended the $8,000 tax credit for qualified first-time home buyers purchasing a primary residence. The tax credit now applies to sales occurring on or after January 1, 2009 and on or before April 30, 2010. You do not have to settle on your home by April 30, you just need to have a binding contract and settle by June 30, 2010. If you are a first time home buyer and make less no more than $125,000 for a single person or $225,000 for a household, you will qualify for the tax credit. The amount is equal to 10% of your new homes purchase price up to $8,000. You can claim the tax credit on your 2008 taxes even if you settle in 2009. If you know that you will settle prior to June 30th, it may be in your best interest to file an extension for you 2008 tax return. This will allow you to receive the credit immediately, as opposed to waiting until 2010. How do I know how much I can get approved for? This is a frequently asked question. It is best to determine how much you can AFFORD, rather than how much you can get approved for. You may be able to get approved for a $2,000 monthly payment, but you only feel comfortable with a $1500 monthly payment. Our advice is always to stay within your comfort zone. It is easy to determine the maximum you can pay for a home while staying within your monthly payment comfort zone. You can find out today’s interest rates here, and use our mortgage calculator here. Take your monthly principle and interest payment and add $500 to it for taxes, hazard insurance and mortgage insurance. This is not an exact science by any means, but it will give you a good ballpark figure prior to shopping for a home. I would recommend working with a mortgage professional to assist you in this step. What additional cost should I budget for when purchasing a home? When you purchase, you will have upfront out of pocket expenses such as appraisal ($400) Home inspection ($300-$400), Termite inspections ($50-$100). You will also want to consider expenses once you move in. These will vary greatly depending on the condition of the home that you will be buying and your individual needs/ When you are budgeting for your new home, it is wise to take into account cost like paint, carpet, furniture, appliance upgrades, etc… These will be one time costs. You also need to budget in monthly recurring costs such as Gas, Electric and Water. Our advice is to take time and look at the big picture prior to shopping for your home. This will eliminate a lot of stress and sticker shock down the line. The department of Veterans Affairs offers arguably the bets financing option for first time homebuyers. The interest rates will be comparable with both FHA and conforming loans. What makes it more attractive is that VA loans do not require a down payment and you do not have to pay a monthly mortgage insurance (MI) premium. If you are a Veteran seeking a mortgage with a minimal down payment, VA is the loan for you. VA offers both ARM and Fixed rate mortgages. 2010 loan amounts up to $812,500 for high cost areas! If you are not a veteran, USDA is another great 100% financing option with no monthly mortgage insurance. USDA does have restrictions. First you need to find out if your property is in an area that is eligible for a USDA rural mortgage. You will be surprised to see that the majority of Maryland and Virginia are eligible for USDA financing. In addition to the restricted areas, USDA also requires that your adjusted gross income does not exceed certain thresholds. USDA interest rates are comparable to VA, the maximum loan amount is $417,000. Click here to find out if your property is eligible for a USDA loan and to learn more about the USDA income limits. FHA is the most widely used program for first time homebuyer. FHA does not require that you are a veteran, it does not limit the areas in which it lends, it does not have income restrictions and it allows for mortgages up to $729,750 in high cost areas. FHA does require a down payment equal to 3.5% of the purchase price of your new home. FHA also requires monthly mortgage insurance. Typically, FHA offers the best interest rates and will be the easiest to qualify for. All of your down payment can come in the form of a gift and FHA does allow for non-occupying co-borrowers if they are an immediate family member. 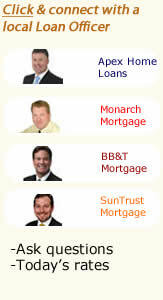 These are traditional conforming mortgages. These loans will require private mortgage insurance (PMI) on loans greater than 80% loan to value. With stricter credit guidelines and higher down payment requirements, these are the least common mortgages for first time homebuyers.